Cougar Cash is your key to savings when dining on-campus. Buy Cougar Cash today, tax free, and youll save every time you use it by not paying the sales tax on your purchases. Cougar Cash has a dollar for dollar value and can be used, just like a debit card, at any of our on-campus dining locations. Anyone can purchase it! To purchase, simply select the plan below and follow the prompts to pay via credit card. You may also visit the Dining Office, located in room #251 on the 2nd floor of the Frost Building, to add more. Have unused Cougar Cash at the end of the semester? No problem! Unused Cougar Cash remains available in your account as long as youre a student at HCC. If there is no activity on your account for one full academic year, any remaining balance is then turned over to the College. 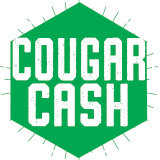 Cougar Cash purchases are non-refundable. $50.00 Cougar Cash Add To Cart "Opens a dialog"